WAX WARS SCRATCH BATTLE: Semi FINAL FEAT. DJ ZERO vs HEAVY HANDS | Crown St Cut Collective RANE and SHURE | SOUL OF SYDNEY FEEL-GOOD FUNK SOUL DISCO vibes & beyond. Crown.St Cut Collective has partnered with RANE, and SHURE to pres. 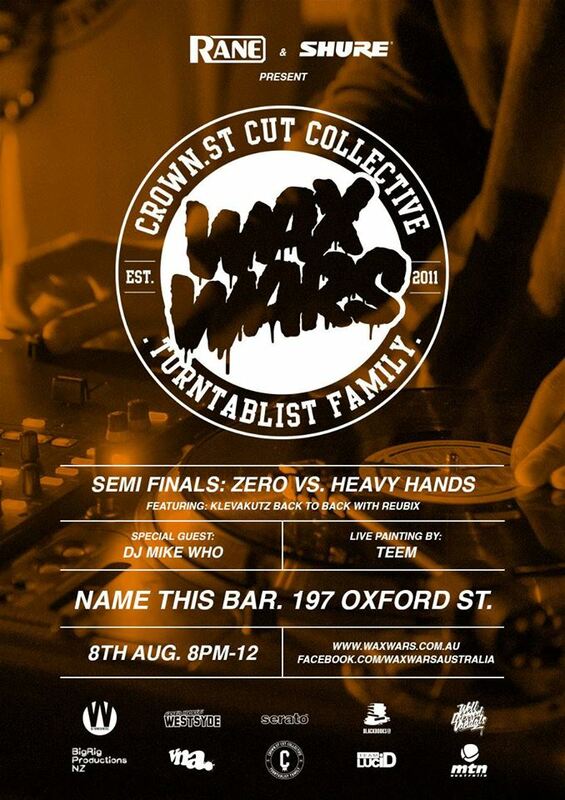 WAX WARS Semi Final at Name This Bar this Thursday Feat. DJ ZERO vs HEAVY HANDS from 8-12pm to decide 3rd place of the Comp. The battle will comprise of three 3-minute rounds between the two turntablists, showcasing on vinyl or Serato Vinyl – juggle routines, word play, scratching and turntable trickery the likes of which have only ever previously been seen at the world-renowned DMC Championships. This week also Sees the Turntable Talents of Dj MIKE WHO (FBI Radio Stolen Records Resident DJ) doing a special guest trick/DJ set on the 1’s n 2’s along with TEEM Painting the WAX WARS Canvas..
Mike who was born close to a volcano, he was raised on a healthy diet of Sicilian olives, cheap cordial and tangerines. Considered the 17th best watchmaker in his rural neighborhood. Mike has since adapted these immense life skills and cosmopolitan upbringing to now be recognized as the king of unnecessary pull-ups and inappropriate music. Championing sounds from all corners of the globe. His skills on the turntables, encyclopedic knowledge and endless crates have allowed him to share the stage, crustless gourmet sandwiches and expensive beer with a host of internationals including Action Bronson, De La soul, Nickodemus, Kero One, Jazzy Jay, The Nextmen, Raashan Ahmad, House Shoes, Africa Hitech, Kurtis Blow, LV, Peanut Butter Wolf, Dj Shortkut, Del Tha Funkee Homosapien, Dj Kentaro, Smoke DZA, Mr Choc, Rob Swift, Mr Thing, Chris Read, Mystro, and Prince Paul to name a few. Mike Who has also supported more local and national big wigs across more styles than you have gotten sweaty or chin stroked to, earning both respect and props along the way. This child of the globe holds down a residency on the wheels of FBi radio’s award winning Stolen Records, where along with brother in arms Shantan Wantan Ichiban they entertain and educate sydney peeps and international listeners on a weekly basis. Mike has also taken out second place in the NSW Rebull Threestyle battle, solidifying his own brand of cross genre party rocking. His unique sets and uncanny ability to read a crowd has seen Mike’s sets melt faces across Sydney and Australia as well as throughout the South American continent. From intimate candlelight bars to peak time festival stages, this happy go lucky chum doesn’t disappoint. Hype continues to brew for this bro, his unique mixtapes are clocking up downloads across the blogosphere and his sound is beginning to infect the airwaves. Teem is a Sydney-based illustrator, stencil artist and graphic designer . Known for his exploration of many ideals (concept) with popular culture and iconic global imagery. His artworks are provocative both in colour and subject. The work employs the use of whimsical imagery, coupled with vivid depictions of bold graffiti language that juxtaposes overlaying pastel colours. The works derive from rich urban landscapes.